When most people switch to a low-carb diet, they sometimes lose track of their favorite hobbies that used to involve the carb and sugar-laden foods, such as entertaining. Being a foodie and my love of cooking for other people, this was simply a part of my life I wasn’t willing to part with! You can still entertain with delicious food that isn’t packed with sugar and grains. When you combine creativity with high-quality ingredients, you can make any dining experience special, low carb or not! My sausage and sauerkraut croquettes are the perfect example of such. They are crispy, packed with flavor and my favorite — super simple! These are great to keep on hand even when you are not entertaining. Just pop them in the oven or deep fry them and GO! My favorite way to eat these croquettes is with ranch dressing or dijon mustard. You can serve these on a platter as is, or if you want to take it a step further, you can put toothpicks through them and serve on a tiny stick! In a large mixing bowl, combine cooked sausage, cream cheese and drained sauerkraut. Put mixture into refrigerator for at least an hour, or until you are able to form balls easily. Pulverize pork rinds and parmesan together (using a food processor is easiest). Roll balls into pork rinds, coating entirely. 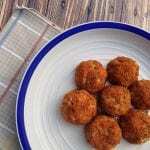 Place coated balls on baking pan lined with parchment. Transfer baking pan to freezer for at least 2 hours or until hardened. For best result, deep fry in coconut oil or palm shortening until golden brown. These can also be made by baking in the oven at 375 for roughly 30 minutes. What’s your favorite dinner party appetizer? Comment below! Hi, I want to make these an freeze until our christmas party and I was wondering if you’d frozen them and if so if you froze them before or after frying/baking? Thanks! I would freeze these before cooking and then bake them right before serving.